The Tri State Tour submitted this past weekend’s results (7/26/15) for their latest event. The stop was staged at Steinway-Cafe Billiards, located at 3525 Steinway Street, Astoria, NY (Queens). 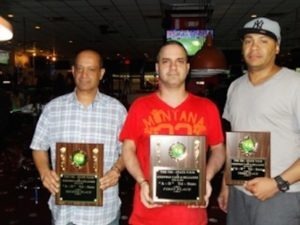 The photo is of the top finishers (left to right): 2nd Place – Amir Rashed Uddin; 1st Place – Miguel LaBoy , 3rd place – Ambi Estevez.